From Beast Kingdom. A PREVIEWS Exclusive! Beast Kingdom's EEA highly movable action figure series has launched the latest head sculpture based on Thor: Ragnarok. It is a revision from the previous more realistic style that makes the hair carving more supple and consistent with the overall shape of the figure. This revised product was launched in the 2017 Comic-Con International: San Diego (SDCC) and received high praises from the public. 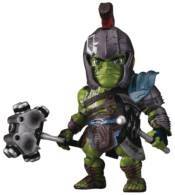 The first character to enter the arena is Hulk in his gladiator armor. For the details to more closely match the movie settings; the helmet, body armor, and the exclusive war hammer and ax are made based on the official specifications. To recreate the atmosphere in the battle arena, the furious facial expressions as well as the tense body shape and muscle lines are carefully reproduced. Finally, a weathering technique is used to give the gladiator Hulk the battle worn and domineering look.